When someone asks me why they should care about Buster Keaton or Charlie Chaplin or Harold Llyod or silent film in general, I point them to this statement from the great James Agee. 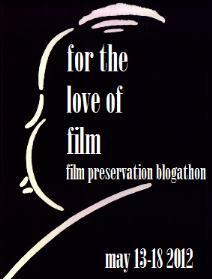 All these people zipped and caromed about the pristine world of the screen as jazzily as a convention of water bugs. Words can hardly suggest how energetically they collided and bounced apart, meeting in full gallop around the house; how hard and how often they fell on their backsides; or with what fantastically adroit clumsiness they got themselves fouled up in folding ladders, garden hoses, tethered animals and each others’ headlong cross-purposes. The gestures were ferociously emphatic; not a line or motion of the body was wasted or inarticulate. 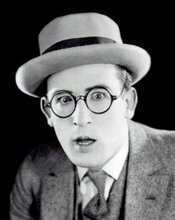 The other day I came across the awesome Hello, Harold Lloyd website and I’ve been poking around it ever since. It’s a wealth of riches, including this amazing piece by Thom Taylor detailing the influences and references to Lloyd’s work in the superb Singin’ in the Rain. It’s not news that Singin’ in the Rain is silent-film referentiall, but to read the carefully tracked details is both fun and informative. And this piece really makes me wish for a book length treatment of the same subject, tracking all of the silent era references in the movie. That would be a great read! I just finished reading Buster Keaton: Interviews by Kevin Sweeney. Hearing what Buster has to say about Buster is not only informative but also entertaining. Last week I ordered a copy of The Silent Clowns by Walter Kerr and I have been patiently awaiting its arrival on my doorstep. Then I remembered that Canada Post is on strike. Well, dang. 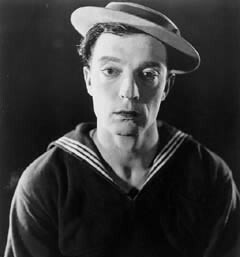 Trying to satisfy my Buster jones with online reading, I came across this list of Buster-related reading on busterkeaton.com, some of which I have read and some of which I haven’t. I would order those unknown titles, but… the strike’s still on, at least until tomorrow. While poking about the interwebs, I found this excellent 2006 review of Conflict from Noir of the Week. 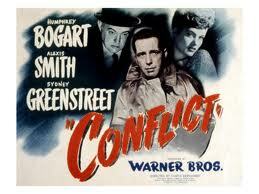 Sadly, as the review notes, Conflict is still not available on dvd. It does appear to be available from Amazon on something called Vee Aych Ess, whatever that is. Spoilers ahoy.